got into law because I liked to ask questions. Like most kids, I asked a lot of questions when I was younger. The problem, especially for my friends and family, is that I never outgrew the habit. My father in particular didn’t quite know what to make of the fact that asking questions seemed to be one of my only real talents, which is why he repeatedly told me I had better become a lawyer. He couldn’t imagine me earning a living any other way. I ultimately followed my father’s advice, and after graduating from college, I attended law school. It fit me like a glove. I felt like I had found my people, which is one of the reasons why, after practicing law for a few years, I decided to become a law professor. After teaching for 15 years at the University of Virginia, I left to become the dean of Harvard’s education school, and recently returned to Charlottesville as the president of UVA. While my career has taken some unexpected turns, my love of questions has never abated — and neither has my belief that the law, at its best, can improve people’s lives in real and meaningful ways. This is why I agreed to share some of the lessons I have learned as a lifelong lover of the law, with the same caveat that accompanies every commercial for a diet pill or piece of workout equipment: Individual results may vary. 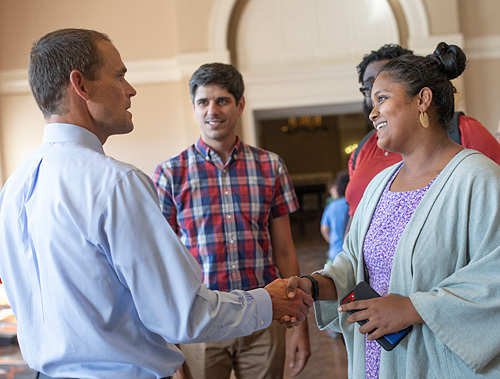 During Jim Ryan’s first day as president, on Aug. 1, he met with his staff and community members. Often, the most important thing is to ask the right question. I have always thought that asking the right question is just as important as discovering the right answer, in part because there is no way to get the right answer if you ask the wrong question. When I think of asking the right question, I think of Justice John Paul Stevens, whom I witnessed in action during the year I clerked for Chief Justice William Rehnquist. Justice Stevens was not as combative, clever or humorous as some of his colleagues on the bench. Yet, in my view, he usually asked the best questions. Indeed, I thought Justice Stevens more often than not asked what seemed to me the key question — the question which, when asked, broke the case open and became the question on which a case turned. If the lawyer could answer the question persuasively, her side would likely prevail. If not, her side would likely lose. The questions Justice Stevens posed, I should add, were not aggressive, nor were they designed to trap lawyers or embarrass them. Instead, they were asked politely and with humility and, by all appearances, with a sincere desire to get to the bottom of the case. I have tried to take the same approach to almost all of my scholarly work since — especially on the issue of how to expand educational opportunities so more students have an honest chance to reach their potential. In my experience, too many of the questions about our education system tend to be strategic rather than sincere — intended primarily, if not solely, to encourage criticism or support of a particular policy or practice. The better approach to this or any debate is to ask questions that confront the strongest arguments and look critically at the most popular solutions without any expectation of what the answer should be. It is the only way to spark more hon­est conversations about what really matters and to discover what might really work. Sometimes failing to act is just as harmful as acting badly. In 2015, I decided to give my commencement speech at the Harvard Graduate School of Education on the sin of omission. It was, to put it generously, an unconventional topic. But as I have grown older, I have come to appreciate that failing to act is often a choice, and one for which we bear some responsibility. It all started in law school when I met the drowning baby. As you may remember, the drowning baby is a well-worn hypothetical used by first-year law professors to introduce the legal concept of duty. The fictional story is simple: A man walks down a street and sees a baby face down in a puddle. He could easily turn the baby over to prevent drowning, but does nothing. The question is whether he is liable because of his failure to act. The answer, which first-year law students are surprised to learn, is no. In general, we have to avoid hurting strangers, but we have no legal obligation to help them. In this case, I feel that the law contains a cramped notion of our obligations toward others. I prefer the more robust concept embodied in the sin of omission: If you have the power to help someone, to right a wrong, or to make your voice heard, you should do so. To see what I mean, consider all the recent tragedies involving police shootings of unarmed African-Americans in places like Ferguson, or the death of Freddie Gray in Baltimore at the hands of police. A lot of our focus has rightly been paid to the killings and the protests that followed, but much less attention has been paid to what we as a society did not do that might have prevented these tragedies. I believe one of the biggest things we have not done in this country is to educate our kids in a way that gives them the ability as adults to see similarities, rather than differences, across race and class. And we continually fail to provide our most vulnerable children, often poor and students of color, truly equal educational opportunities. Even the most stubborn facts of life can change. As lawyers, we have an obligation not only to ask why some­thing is the way it is, but also to ask whether it could be different. Take a social problem like school segregation, which I studied as a law professor. If we define school segregation as a system where students are compelled by law to attend one school or another based on race, that system was struck down by Brown v. Board of Education in 1954. But de facto segregation — meaning segregation that is not compelled by law, but is instead caused by a range of other factors — continues to exist. In fact, over the last 20 years or so, our schools by some measures have become more segregated by race and socio-economic status, not less. Programs to integrate schools are being dismantled, and since neighborhoods remain segre­gated, so do neighborhood schools. Meanwhile, charter schools tend to focus on serving poor students of color, not on creating integrated schools. As a result, between 1988 and 2013, the number of schools with less than 10 percent white enrollment tripled to 18.6 percent. But those stubborn facts have not stopped advocates from pushing for things like more integrated neighborhoods, op­tions for students to attend schools outside their segregated neighborhoods and charter schools that focus on diversity as part of their mission. Little by little, these advocates have brought renewed attention to segregation, to the point where former U.S. Secretary of Education John King made school integration and diversity a key part of his agenda. There’s a long way to go before integrated schools become the rule rather than the exception. But the fact that progress is being made at all proves that even the most stubborn facts of life are worth questioning — because they might not be quite as stubborn as they seem. It's possible to build strong relationships with people with whom you disagree. As I mentioned before, I spent a year as a law clerk for Chief Justice Rehnquist shortly after I graduated from law school. Part of my job, along with my two co-clerks, was to help prepare “the Chief,” as we called him, for oral arguments. Most other justices asked their clerks to read through hundreds of pages of written material to prepare “bench memos” summarizing the facts and procedural history of the case, as well as arguments made in the various briefs. The Chief did not require us to write bench memos. Instead, he prepared for oral arguments by taking a walk around the block with the clerk responsible for the case. During my year of clerking for him, I came to both admire and have a great deal of affection for the Chief. Despite our differences, he was always willing to listen, and he taught me that it is possible to build a strong relationship with someone with whom we disagree. I learned the same thing from my friend and law school roommate, Doug Kendall, who died in 2015. Doug was a constitutional lawyer who challenged both the liberal and conservative interpretations of the Constitution — believing that you can be faithful to constitutional principles even if the application of those principles changes over time in light of new facts. To advance his view, Doug created a public interest group called the Constitutional Accountability Center. In a relatively short time, Doug and his colleagues established CAC as one of the leading voices in debates about the Constitution, and in the process helped change the conversation and earn the respect of liberal and conservative lawyers alike. In an era where it is too easy to believe that those with whom we disagree are evil, ignorant or both, the Chief and Doug taught me the importance of resisting that tendency and seeking common ground. There's a person behind every case. Before returning to UVA Law School to teach, I practiced law at a firm in Newark, New Jersey. I chose the firm in part because they sponsored a public interest fellowship that allowed the fellows, of which I was one, to work solely on pro bono cases. One of those cases involved a man I’ll call “Patrick,” a Cameroo­nian journalist seeking political asylum in the U.S. While broad­casting on a state-owned television station about election results in Cameroon, Patrick made the brave and dangerous decision to report live on rampant election fraud committed by the government. By the time he got back to his office, police were waiting for him. In the months that followed, Patrick was imprisoned and bru­tally tortured until his mother was able to bribe a guard to release him in the middle of the night. It was then that Patrick began an odyssey across several continents, only to be arrested in the U.S. for entering under a false passport and sent to a detention facility in Newark. A human rights group identified Patrick’s case and sent it my way. Patrick’s statement jolted me. After researching more about the asylum process, I learned that those awaiting an asylum hearing could be released to a family willing to take them in. At the time, my wife and I lived with a newborn in a tiny apartment, but a generous colleague and her family volunteered to host Patrick. When I took Patrick’s case, I knew that being detained was not his first choice, but I thought it would be a small price to pay if he received asylum. A better lawyer would have thought about Patrick himself, about the trauma he had endured, and about what was best for him — not just as a client, but as a human being. My father never attended college, but he made sure to impress on me from a very early age that the highest call­ing in life is to serve others. For me, that is what the law is all about — a chance to speak for those without a voice and make the system work a little bit better for those who need it. And while your journey will necessarily be different than mine, by asking the right questions, doing what we can to help, refusing to accept the world as it is, building re­lationships with people with whom we disagree, and seeing the humanity in the work that we do, I truly believe we can leave this world a little better than we found it.